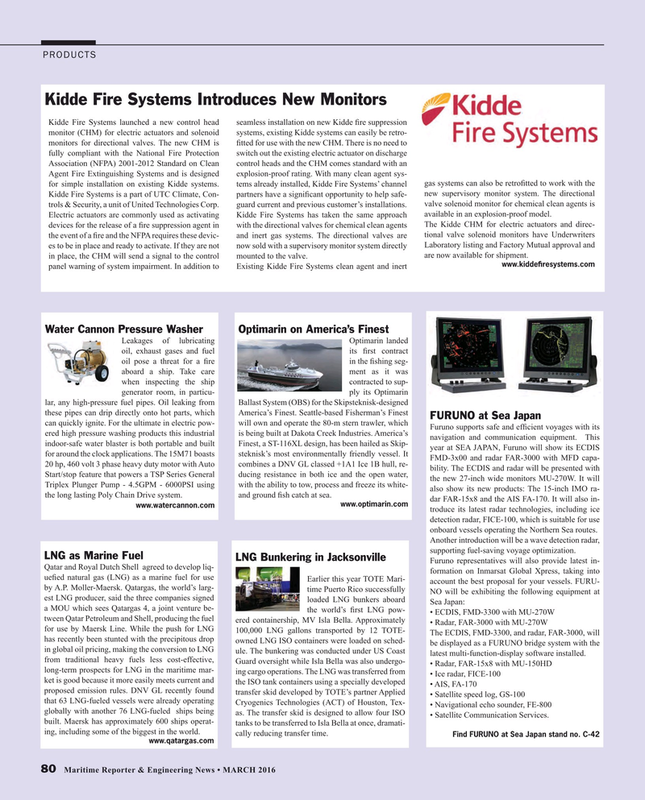 Kidde Fire Systems is a part of UTC Climate, Con- partners have a signi? cant opportunity to help safe- new supervisory monitor system. The directional trols & Security, a unit of United Technologies Corp. guard current and previous customer’s installations. valve solenoid monitor for chemical clean agents is available in an explosion-proof model. Triplex Plunger Pump - 4.5GPM - 6000PSI using with the ability to tow, process and freeze its white- also show its new products: The 15-inch IMO ra- the long lasting Poly Chain Drive system. and ground ? sh catch at sea. dar FAR-15x8 and the AIS FA-170. It will also in- www.optimarin.com www.watercannon.com troduce its latest radar technologies, including ice detection radar, FICE-100, which is suitable for use onboard vessels operating the Northern Sea routes. Another introduction will be a wave detection radar, supporting fuel-saving voyage optimization. The ECDIS, FMD-3300, and radar, FAR-3000, will has recently been stunted with the precipitous drop owned LNG ISO containers were loaded on sched- be displayed as a FURUNO bridge system with the in global oil pricing, making the conversion to LNG ule. The bunkering was conducted under US Coast latest multi-function-display software installed. Cryogenics Technologies (ACT) of Houston, Tex- • Navigational echo sounder, FE-800 globally with another 76 LNG-fueled ships being as. The transfer skid is designed to allow four ISO • Satellite Communication Services. built. Maersk has approximately 600 ships operat- tanks to be transferred to Isla Bella at once, dramati- ing, including some of the biggest in the world.